Tangkula Computer Desk Wood Home Office with Pull Out Keyboard Tray for Small Places PC Workstation Office Furniture (Black Without Wheel) by Tangkula at Momiji Studios. MPN: AM1290HM. Hurry! Limited time offer. Offer valid only while supplies last. 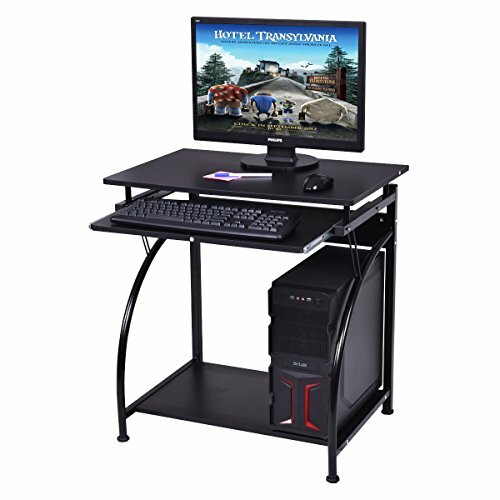 Description:This Is OurBrand New Computer Desk, Which Is A Perfect Furniture For Your Home Or OfficeAnd Provides You With A Unmatched Convenience. This Is OurBrand New Computer Desk, Which Is A Perfect Furniture For Your Home Or OfficeAnd Provides You With A Unmatched Convenience. The Engineered Wood ConstructionAnd Powder Coated Steel Frame Provide Years Of Sturdy And Reliable Use. ItFeatures A Smooth Slide-Out Keyboard Shelf And A Full Size Workstation,Allowing You To Lay Out Your Tasks And Complete Them Efficiently. An ExtraBottom Shelf Provides Space For The Computer Host Or Books. Buy Yours Today! Keyboard Size ofComputer Desk: 23.2"L×9.4" W, Height Form Floor To Bottom Shelf:2.8"
【Simple Design & Compact Style】The Tangkula computer desk comes in simplistic color, the color will be suit for any decor. The appearance is compact and simple. The curved design of the leg of the table is very smooth and beautiful. The computer desk is practical and also perfect furniture to decorate your home study room or workplace. 【Practical & Multifunction】 Large full-size workstation will never let you down. You can lay your books, papers, documents, laptop, monitor on the spacious tabletop. And you can put plants, host or printer on the below shelf. It features a smooth slide-out keyboard shelf. It can totally maximize the daily working and reading enjoyment. 【Durable & Sturdy】The Tangkula computer desk is make of high quality MDF board and powder-coated metal frame, which ensures sturdy and durable & anti-corrosion and anti-rust. It provides enough durable and skin-friendly work surface and lets you spread out comfortably. 【Installation & Easy to Clean】The Tangkula computer desk is need to be assembled by yourself. You can quickly assemble the item and use it in a clear and easy-to-understand manual. And with wet cloth you can wipe dirty stain easily from the surface. 【Shipping & Customer service】Ups or usps will deliver the item to your house in 3-6 business days after you placed an order. We packed this computer desk as good as we can, if there is any part missing or damaged during shipping, please contact us first and offer us pictures of damaged part, we will solve the problem as the way you want.